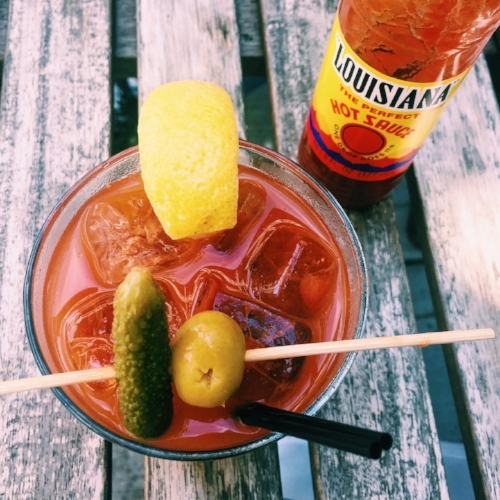 All of our Bloody Mary classes are BYOB (Bring Your Own Brunch), so whether you want to bring along or head out before or after class, we've got you covered. Ukrainian Village and our surrounding 'hoods have some awesome and unique spots for noshing, no matter what you crave. 1. Shokolad - Our HQ is above Shokolad, and we can't say enough about their casual Ukrainian fare. They have awesome omelettes, pierogi, and crepes. 2. WHISK - Sweet tooth? You can't get more interesting pancakes and french toast than from WHISK. From Oreo Raspberry pancakes to Snickers stuffed french toast, you'll be in love. They also have awesome hashes! 3. Cafe Marie Jeanne - Take away some of the best pastries (good lord the doughnuts and croissants), or some smoked brisket. 4. Lockdown Bar and Grill - Not craving breakfast or brunch? Burgers also pair perfectly with Bloody Marys, and we think Lockdown has some of the best. 1. Spinning J - Pies galore (S'mores Pie is ridiculous) and their sodas and shakes will have you drooling, but don't overlook their breakfast sandwiches and pot pies. Plus this place is just cool and vintage and unique. 2. Cafe Marie Jeanne - A rad a la carte brunch menu, the cheddar biscuits, lox, and cheddar grits are so so good. 3. BITE Cafe - Delivery available, too, though we prefer eating their food piping hot straight out of the kitchen, BITE offers some vegetarian dishes and they have poutine! We're huge fans of the grilled cheese and tomato fennel soup. 4. Hash - I think it goes without saying that you should be eating their hash here. The Pork Bubble & Squeak makes us happy. 5. FEED - One of our faves. Cash only. Go with the special of the day. Also, bring some quarters and try to win a golden egg! A morning must. Our good friends from Dark Matter roast their beans just down the street from us, and you can grab an amazing coffee or latte across the street from us at Star Lounge, one of their rad coffee bars.